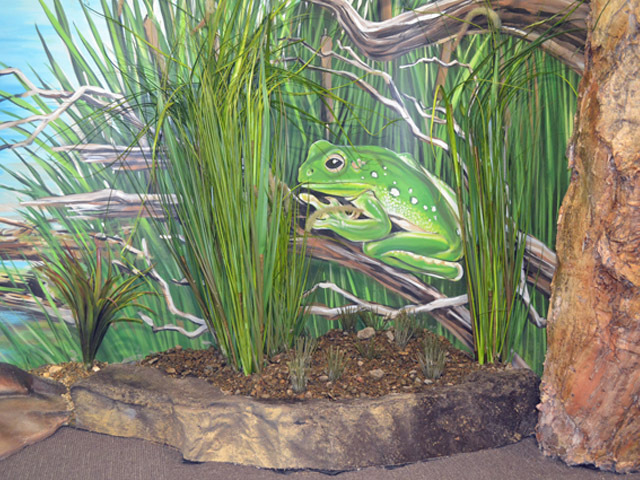 A recently completed mural by Natureworks graces the halls of the Ipswich Environmental Education Centre complete with 3D artificial trees and realistic animal sculptures from the local area. For over 30 years Natureworks has built 100’s of spectacularly realistic artificial trees that can be found in museums, resorts, playgrounds, retail outlets, zoos, environmental centres, childcare centres, theme parks, public projects, libraries, private homes and more around the world. 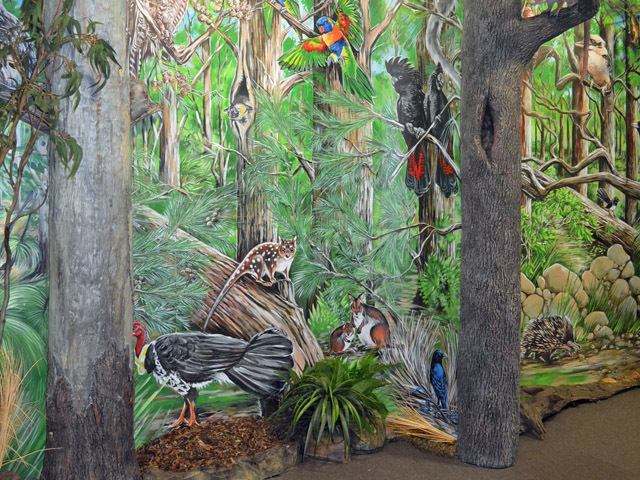 One of their most recent projects, a 3D mural wall, was completed at the Ipswich Environmental Education centre, realistically depicting the local flora and fauna of the area. Every tree creation by Natureworks is handcrafted and unique. 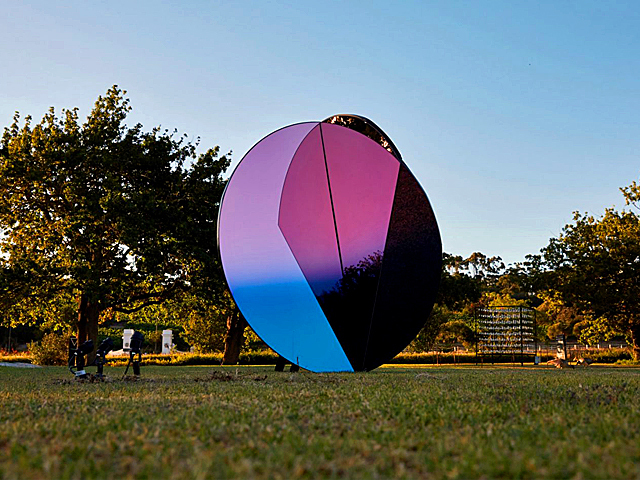 A mixture of both live and artificial materials is used to blur the lines of reality and confuse the eye. 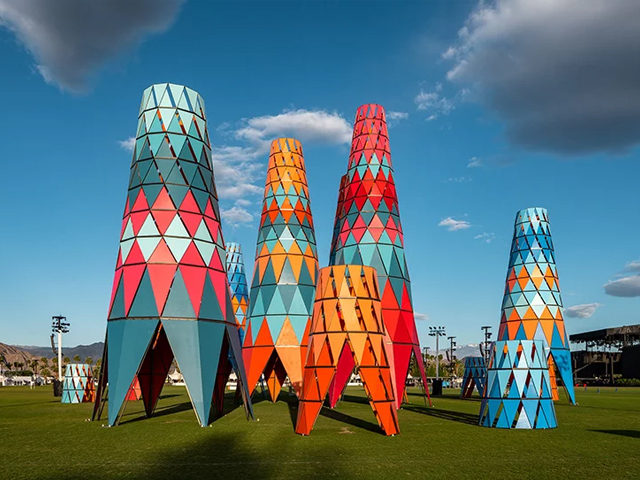 Depending on the client’s requirements, Natureworks’ handmade creations generally include a steel framework and a combination of fibreglass, concrete or polyurethane foam, and textured with a bark-like material that is sculpted then hand painted. 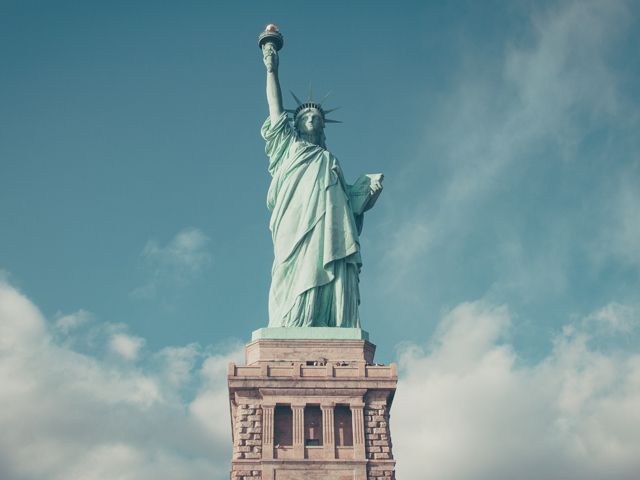 Occasionally genuine bark is used, which is chemically treated for preservation. 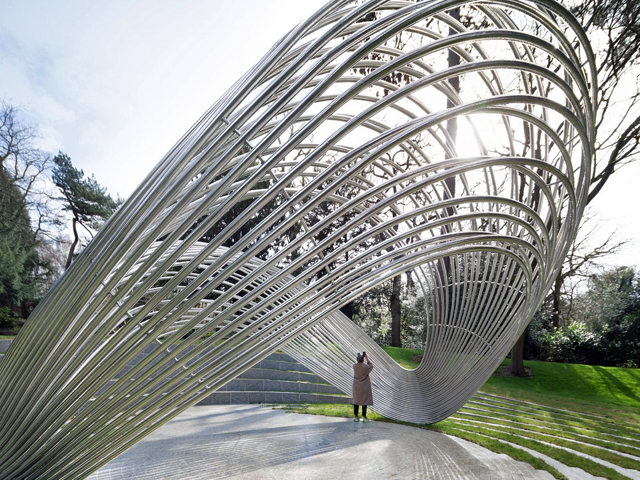 Finishing touches that are a reflection of nature, such as knots and lines or weeping sap, seeds, roots or flowers, are then added as required. External tree roots can also be sculpted to anchor the base, or it can have a hollow base to create a cubby like room underneath. For the Ipswich centre, each tree and corresponding wildlife section were created to encapsulate individual unique characteristics:Blue Gum forest with scrubby dry understory; She-oak section with light rainforest greenery; heavily wooded Bloodwood sector with native grasses and cycads; Wetland Tea Tree swamp with 3D reeds and real paper bark construction. 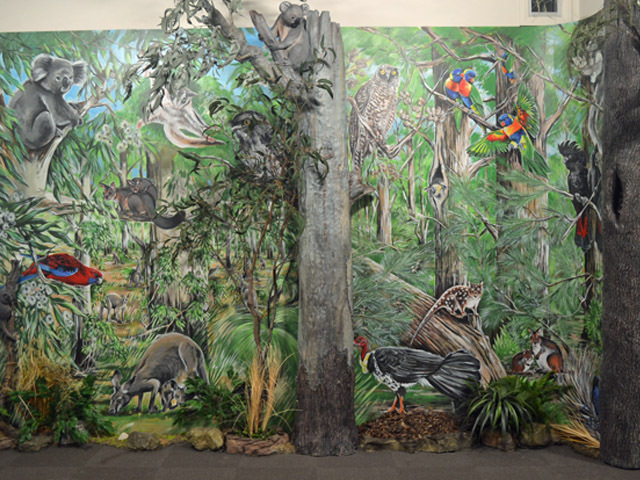 The hand painted educational mural highlights the unique flora and fauna species endemic to each area depicted. The animals have been enlarged proportionally so as to make them the stars of the show. 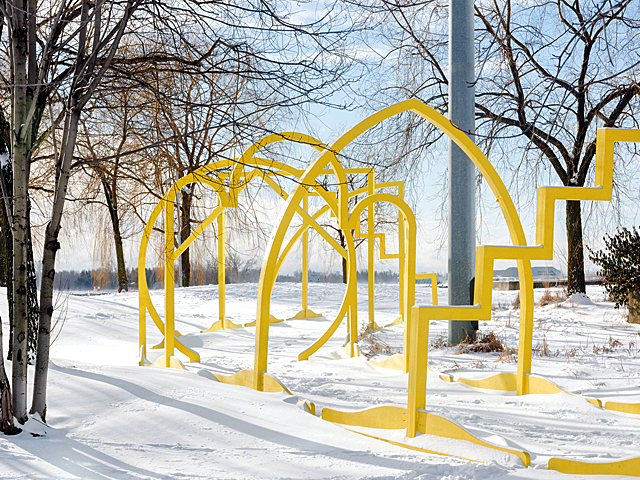 The completed mural was meticulously painted onto five individual panels, blending each habitat with its neighbour, and was designed to be installed onsite. 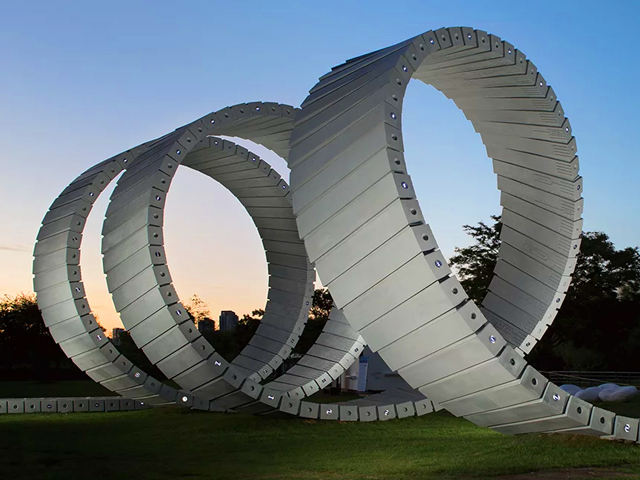 The overall length is 12m wide by 3m high. 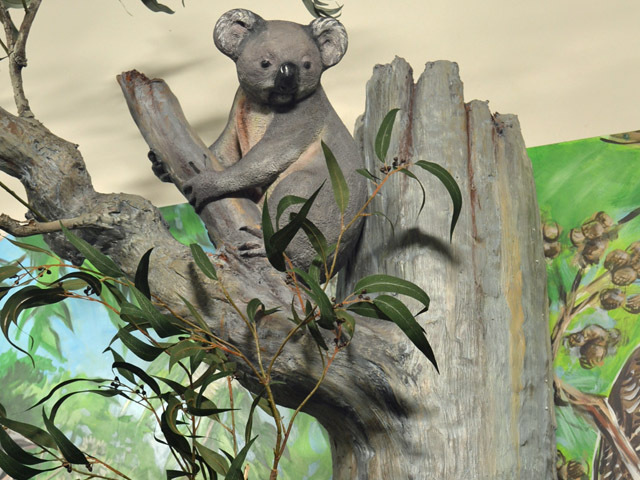 To complete the display, the base of the habitats incorporate realistic 3D fauna sculptures: platypus, frog, echidna, quoll, koala, black cockatoo, goanna, bats, and possum. If you are creating an immersive themed environment, such as a playground tree slide, a climbing tree, a reading tree for childcare facilities and playgrounds, or even a hotel lobby art installation, Natureworks can help by adding realistic elements to make it truly come alive.